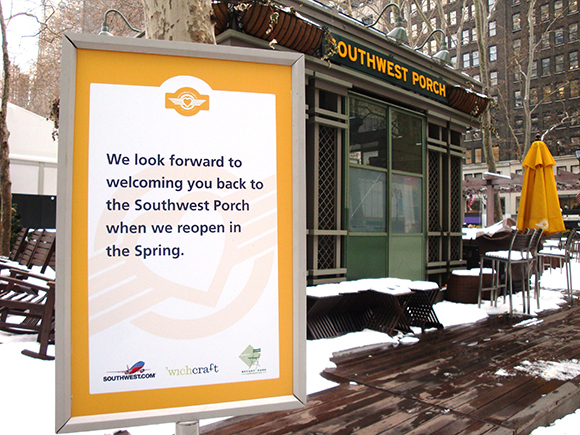 The Southwest Porch is closed for the rest of the winter season. While the Porch's rustic fire pit and outdoor heaters will be missed during these cold weather months, we're choosing to look on the bright side. A closed Porch means we can all look forward to a reopening party in the Spring! In the meantime, you can still get your 'wichcraft fix from the kiosks located at the 42nd Street and Sixth Avenue corner of the park (don't forget the daily happy hour deal on coffee and tea), or warm up with three flavors of hot chocolate at the newest 'wichcraft kiosk on the south side of the park.